We have assembled a list of 10 attainable goals for Cyclone football in 2011. The list of goals below goes in order from easiest to hardest to accomplish. 1. 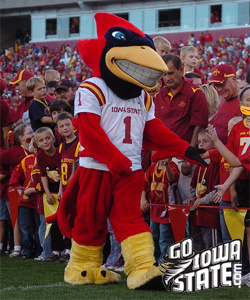 Beat Iowa – I wouldn’t usually put beating Iowa on ISU’s top 10 goals list, but it is very important for Paul Rhoads and the Cyclones to have a good showing in the game this year. 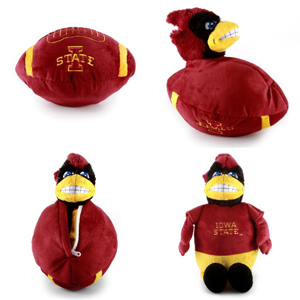 Iowa has thumped ISU in both match ups since Rhoads has taken over as coach (35-7 in 2010 and 35-3 in 2009). Iowa State needs the game for a couple of reasons; first it is a very important game for ISU’s bowl eligibility, and secondly to gain some respect back in the state. 2. Beat a ranked opponent – With Iowa State’s schedule they will have several opportunities to beat a ranked opponent. The teams that are currently ranked include Texas, Missouri, Texas A&M, Oklahoma State and Oklahoma. The Cyclones get Texas, Texas A&M and Oklahoma State at home, so those games probably present the best opportunity for a win. Iowa is just outside the top 25 and could be a ranked opponent when Iowa State plays them next week. 3. Win all 3 non-conference games – The three non-conference games come at the beginning of the schedule, so winning the first 3 games would be a huge confidence boost for Iowa State heading into the conference slate. All three games are winnable (9/3 UNI at home, 9/10 Iowa at home, 9/17 at UConn) and are very important for ISU’s bowl chances. Winning 2 of 3 is an absolute must. 4. Go at least .500 on the road – The good part about Iowa State’s schedule is they have some winnable games on the road. Oklahoma and Missouri will obviously be very tough, but the Cyclones should have an opportunity to win the other 4 games (UConn, Baylor, Texas Tech and Kansas State). 5. Beat Texas or Oklahoma – In these days of conference realignment, getting victories against the “haves” in the conference is very important. Winning on the road at Texas last year was HUGE. Oklahoma currently hast the longest home winning streak in the nation at 36 games, so winning in Norman will be difficult to say the least. Texas had a losing record last year and is a team lacking confidence right now. The Cyclones gets UT at home this year, and they play them early (October 1). A two game winning streak against the Longhorns sounds pretty good to me. 6. Beat Texas A&M – In all likelihood, this will be the last time Iowa State will play the Aggies in the regular season for some time. The Cyclones lost to Nebraska and Colorado in their final games last year. It would be great to end this series with a “W”. It will be a tough task, as many have the Aggies as a Top 10 team this year. 7. Protect Jack Trice Stadium (win 4 games) – It will be tough for Iowa State to win two-thirds of its games at home this year, but if they can accomplish that goal it should be a good season. The best opportunities for victories would appear to be Northern Iowa, Iowa, Texas and Kansas. 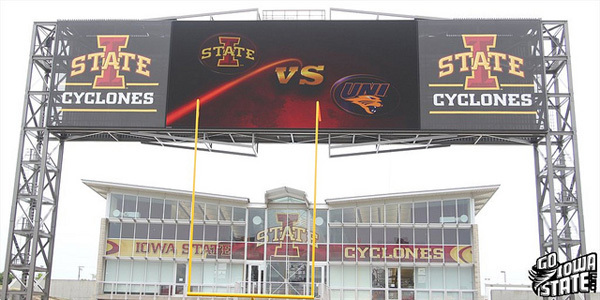 Texas A&M and Oklahoma State fill out the remainder of ISU’s home schedule. 8. 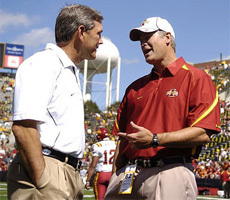 Win 6 games and become bowl eligible – As Paul Rhoads always says, the goal every year for Iowa State is to make it to a bowl game and win it. The Cyclones schedule is tough, but it does include seven games against teams that are not currently in the Top 25. It won’t be easy, but it is certainly within reach. 9. Win the bowl game – Just getting to the bowl game is most likely going to be the hardest part. If Iowa State gets to 6 or 7 wins, there is a good chance the bowl opponent will actually be one of the easier games on their schedule. 10. Winning record in the Big 12 – Iowa State needs to prove it belongs in a power conference. Having a winning record in the Big 12 this year would be a huge statement for the Cyclones. How does Iowa State get to 5 wins in the conference? We will go with wins over Texas, Baylor, Texas Tech, Kansas and Kansas State. 2010 Season Review – Which Goals Were Achieved?